This statement comes from a 2013 systematic review on conservative treatments for coccydynia… isn’t it so encouraging? We discussed what coccyx pain meant, the causes, and the examination approach last week in Part 1 of “A pain in the tail…bone.” Today’s post will take a close look at my approach for treating people with tailbone pain and what we do know in the current research. Unfortunately, as you see from the comment above, research for the best treatment for tailbone pain is significantly lacking…so we’ll have to rely on my clinical experience as well as the knowledge from courses I have attended and practitioners I have collaborated with in the past. So, what should treatment for tailbone pain include? Cold packs/hot packs: Basic, I know, but they feel good and can help a sore coccyx feel better after a long day. I prefer ice, but others prefer heat. I recommend using for about 10-15 minutes, a few times per day or as needed. Recent recommendations always include using cold/heat as needed. Alignment, & Cushions when needed: Alignment, especially in sitting, is very important for reducing pressure on the tailbone in the initial phase of treatment. Slumpy postures actually put more pressure against the tailbone and neutral postures distribute weight to the bony parts of our pelvis more evenly. Along with this, firm comfortable chairs tend to support a more neutral posture, but cushy couches or chairs usually promote a more slumped posture. As I mentioned in my previous post, many people with tailbone pain tend to develop a side-twisted sitting posture. It makes sense– they’re trying to unweight the tailbone–but over time, this “wonky” sitting can lead to low back pain, and that’s not fun for anyone! 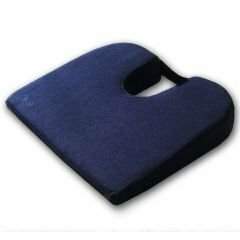 So, we need to learn to sit up comfortably, and a good tailbone cushion can be a helpful tool for that. Note: Donut cushions don’t tend to help as much with tailbone pain unless the pain is totally referred from the pelvic floor musces. These unweight the perineum due to the center cut-out, but they don’t unweight the coccyx. A cushion that has a back cut-out, like the ones pictured tend to be more helpful. Body Scanning or “Check-ins”: Many people with tailbone pain will clench muscles around the tailbone as a protective strategy–usually the glutes and the pelvic floor to be precise. As we discussed previously, these muscles can refer to the coccyx, so it is important that we decrease this hypervigilant clenching pattern. I typically recommend scanning the body, or checking-in, a few times a day to feel if muscles are clenched hart or relaxed. If you feel any clenching, try to drop the muscles and allow them to let go. Pelvic Floor Drops: As mentioned previously, many people with coccyx pain have tender and over-contracting pelvic floor muscles. Pelvic floor drops are exercises that encourage a completely relaxed pelvic floor. Typically, these pair well with breathing exercises as functional diaphragm use can encourage appropriate pelvic floor relaxation. Soft tissue treatments: This should not be a horribly painful experience! Skilled clinicians can help to improve sensitivity and tender spots in the buttocks, hips, low back muscles and pelvic floor muscles. For the pelvic floor, this can be done externally, vaginally (in women) or rectally. Specifically, the coccygeus, iliococcygeus, pubococcygeus and obturator internus muscles should be evaluated and treated. Sometimes dry needling can be helpful also in reducing soft tissue sensitivity. Coccyx Mobilization: The coccyx can be mobilized some externally with a person in sitting (I use what is called the “closed-drawer technique” here). The best way to mobilize the coccyx is with internal rectal treatments. Internal rectal mobilizations or manipulations can include direct mobilization into flexion or extension, distraction of the coccyx and mobilization into sidebending. The most recent review I found published in 2013 found 3 studies looking at intrarectal manipulation for coccyx pain and all of them did show some improvements in pain for patients…but from a research standpoint, 3 studies is hardly anything and to be honest, the studies weren’t that good. So, we’re stuck with some of my clinical opinion 🙂 I believe intrarectal mobilization can be hugely beneficial for patients! And, I shouldn’t have to say it–but it should always be done by someone trained and skilled in performing it. I often will also use a little bit of taping to help support what I do manually and give my client some input on what I want their bodies to do. I like kinesiotape the best for this and use a few different techniques depending on the person. McConnel tape can also work well. 3. Retrain the Nervous System: Our brain rules– remember, pain is our brain’s alarm system to tell use there is a problem and to protect. A person who has had coccyx pain for a long period of time may develop a sensitized nervous system–and it is so important that this be addressed! So as not to re-invent the wheel, you can read more about it in my previous post reviewing the book, Why Pelvic Pain Hurts, and in my previous post summarizing my presentation to the Atlanta Interstitial Cystitis Support Group. Side-note: Pain neuroscience is currently not discussed often enough in the research regarding treatment for coccydynia. I think this is a huge problem–we know that experiencing pain for a long period of time truly impacts the nervous system and we can’t ignore that! This case study showed 2 patients treated for tailbone pain–one was acute, treated immediately and got better quickly. The second had pain for over a year before being treated and did not get as good results– could this “brain retraining” be the missing piece? I think it can’t be ignored. 4. Manage Bowel, Bladder and Sexual Problems: Remember, the pelvic floor muscles attach to the tailbone, so it is so common for people with tailbone pain to notice bowel, bladder or sexual symptoms. This should always be addressed with good behavioral education and appropriate treatment techniques. I’ll leave it at that…because each one could be a few blog posts in and of themselves. 5. Return to Normal Function: I talk about this in almost every post, but ultimately, our goal is always to get you back to moving, sitting, exercising, etc. as quickly and effectively as we can. As pain decreases, our goal is to retrain the system to function optimally. We do this by retraining proper patterns of muscular activation (yep, diaphragm, pelvic floor, abdominals, low back…with all of the other muscles! ), teaching movement with lots of good variation, and a lot of education. So, that about sums it up… PTs out there, did I miss anything important? I would love to hear from you and start a discussion! For those of you out there dealing with tailbone pain–please let us know how we can help you better! If you have not tried working with a pelvic physical therapist in the past, I do strongly recommend it! This entry was posted in Coccydynia, Male Pelvic Floor, Pelvic Pain and tagged Chronic Pain, Coccydynia, Male Pelvic Floor, Pelvic Pain. Bookmark the permalink. Hi Penny! I apologize that I did not see your comment earlier!! I hope this still gets to you! The TMJ and the pelvic floor are connected. We find that when people hold tension in one part of the body, they can also hold tension in another part. Additionally, the pelvic floor works to modulate pressures in the abdomen, trunk and pelvis, and will be impacted by what is happening at the spine on up to the TMJ! I hope this is useful!! I’m so sorry you’re having bowel and tailbone problems! Seeing a skilled pelvic PT would be a great idea. If you go to pelvicrehab.com, you’ll see there are several in your area. I would recommend starting with someone who either has “PRPC” or “WCS” behind their name, as this indicates specialization. I hope that helps!! Best of luck in your healing journey! Jessica, This is a very belated “thank you” for the information you provided in this forum. I suffered from tailbone pain for a year and went to several doctors, none of whom were of any help. After some online searching i came across your site. I asked the colo-rectal doctor if he would give me a referral for pelvic floor pt, but he said no, that it would make things worse! Fortunately i was able to get my ob/gyn to give me the referral and finally found relief. I cannot recommend heidi boothby from Troy Beaumont in Michigan (Detroit area) highly enough (248) 650-1515). She was professional, caring, thorough, and willing to try many different things to alleviate the issue, along with giving me exercises to keep the pain at bay after therapy was done. For me, i realized that this is a lifelong issue that requires me stretch the piriformes muscle daily. I have found that yin yoga is helpful, or even doing stretches such as sleeping swan at home on a daily basis. Massaging that muscle (pressing into it with your thumb) and sitting/rolling on a foam roller to get deep into the muscle have also been helpful as daily practices. And as a last resort using the internal release tool from pt. Many thanks for putting this information out there. Thanks so much for your note! I’m so glad to hear you’re doing so well!